Mackenzie Knightley is the criminal trial attorney in the firm he founded with his younger brothers Trent (A Single Kiss) and James (The First Kiss). He is the best at what he does, the criminal lawyer prosecuting attorneys in Damson County, Maryland, most hate to face in the courtroom. Even with a ferociously busy calendar, Mac finds time for to work as a farrier. He is at the Damson County Therapeutic Riding Association working with a neglected horse when he learns that the new owner of the four-hundred acre farm on which the Knightley brothers grew up needs help with two draft horses she has just discovered on the farm. Because he has a feeling he may know the horses, Mac volunteers to provide the needed help. He may be prepared for Daisy and Buttercup, horses that his father bought shortly before his death, but he is not prepared for the farm’s new owner to be an outspoken blonde who has him wanting to know her better. Sidonie Lindstrom views her move to Damson County as a stopgap measure. She has no plans to stay there, but buying a farm allows her to live more cheaply until her brother’s estate is settled. It also offers a better, safer place for her sixteen-year-old foster son, Luis Martineau. She knew rural life would be different from what she was used to, but nothing could have prepared her for the super-size horses who end up in her stable, her foster son’s affection for those horses, or the sigh-worthy neighbor who can shoe a horse, befriend a teenage boy, and send Sid’s heart beating triple-time. 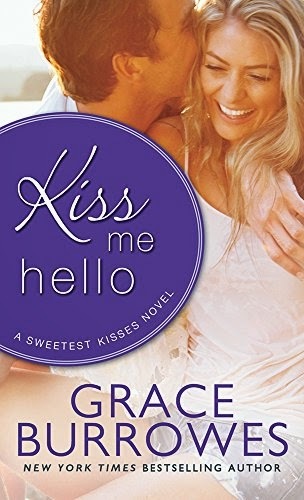 This is the third novel in Grace Burrowes’s Sweetest Kisses series, her first contemporary series. Mac and Sid are interesting, engaging characters who quickly have readers rooting for their HEA. Beneath Sidonie’s fierce independence and Mac’s need to fix every problem for those he cares about are two vulnerable people who eventually come to understand that they need each other. Luis is an appealing character, a believable teenager with the usual mood-swings, insatiable appetite for snack foods, and the paradoxical qualities of a boy growing into manhood. His conflicting loyalties to his birth family (the mother who is in prison and his two younger sisters) and to Sid and the family the two of them have created add another layer to his character. Fans of the first two books will enjoy seeing Trent and James and their respective families appear in this book. I appreciated that their appearance felt organic rather than contrived to please series-loving readers. I am always a bit leery when an author who has written books I have loved in one subgenre of romance writes in another subgenre. Too often books in the new subgenre fail to measure up to familiar favorites. This was not true of Burrowes. Her gift for creating multidimensional characters with fascinating family ties that made the Windhams one of my all-time favorite historical series is evident in Kiss Me Hello and the other Sweetest Kisses books. These contemporary romances have earned a spot on my keeper shelves, and I’m keeping my fingers crossed that Burrowes will continue to write both historicals and contemporaries. I highly recommend Kiss Me Hello. It can be read as a standalone, but why would you want to miss the delight of reading the first two books as well. They all get a thumbs-up from me. I've enjoyed a few of her historicals. I will have to try her contemporaries too. Great review, Janga. And I have the same fear of genre-skipping writers. Good to know this works out. Janga, did you just add three books to my wishlist in a few phrases? Yes, of course you did! Thanks, Janga! I think I'm going to download these and save them for my next trip to the beach. What Bridget and PJ said! I have been hesitant to try the contemporaries because I love and get lost in Grace Burrowes' historical romances. I can't resist a book with horses in it, so my TBR has grown by three. Grace Burrowes is my favorite historical author but I am sure I am going to love her voice in these too even though I don't read a lot of contemporaries. Love the review. I can't wait to read this books. Thanks for the rec, Janga. I downloaded the novellas that came before the books, A KISS FOR LUCK and KISS AND TELL, last week. One was free and the other was 99 cents. I figured it was a good way to judge if I'd like Grace's writing and voice before I bought the rest of the books in the series. Good to know they're keepers for you. Grace is excellent whatever genre she writes. I'm busy clicking my way poor making sure I don't miss a one. Did not know she was writing contemporaries. I will be looking for this series. Thank you for the review.